Herbert Hoover writes to Woodrow Wilson regarding negotiating with Cuba about sugar prices. The purpose of Mr. Gonzales’ visit is now necessarily modified by acceptance by Cuba of the terms which we proposed and as the Cuban Commission has expressed it is well satisfied I do not assume that any further opposition will be exerted. Mr. Gonzales’ views were identical with those of President Menocal but I cannot bring myself to believe they were based upon such searching investigation of the cost of production as we had previously made and the figures with regard to which were practically agreed by the Cuban producers themselves. I was very glad indeed to see him and to outline some of the difficulties that we would have to face with Cuba in the necessity to reduce the exports of bread stuffs from this country. 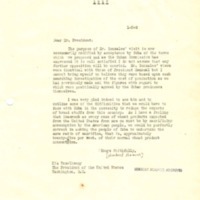 As I have a feeling that inasmuch as every once of wheat products exported from the United States from now on must be by sacrificing consumption by the American people, we would be perfectly correct in asking the people of Cuba to undertake the same ratio of sacrifice, that is, approximately twenty-five per cent. of their normal wheat product consumption. Hoover, Herbert, 1874-1964, “Herbert Hoover to Woodrow Wilson,” 1917 December 1, WWP19282, Hoover Institute at Stanford University Collection, Woodrow Wilson Presidential Library & Museum, Staunton, Virginia.